Online assessment software helps teachers and trainers to create online tests and quizzes easily. Using the quiz software, businesses can create tests to screen potential hires or assess skills of existing employees. Likewise, teachers can create online tests, on any topic, and assign it to students. 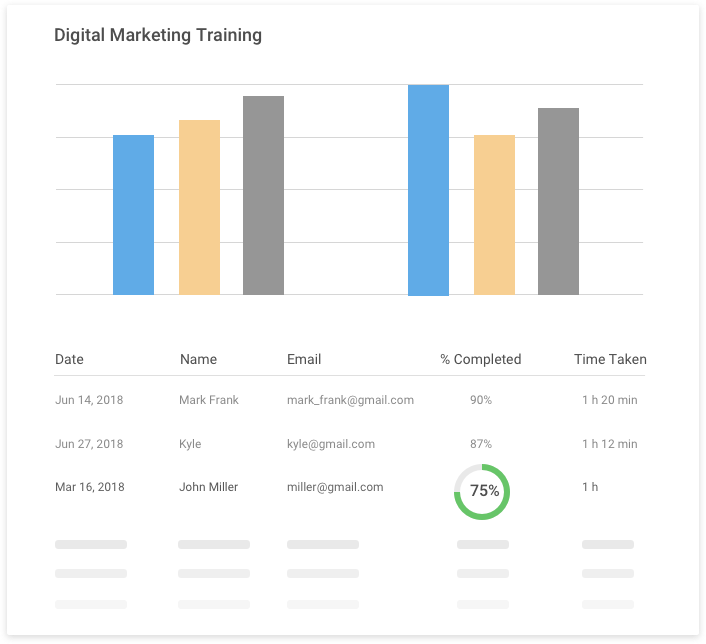 Additionally, the software also helps instructors to view test reports, manage learners via online classrooms, award certificates to learners and do much more. Easily create online assessments in minutes using world’s #1 online assessment software. 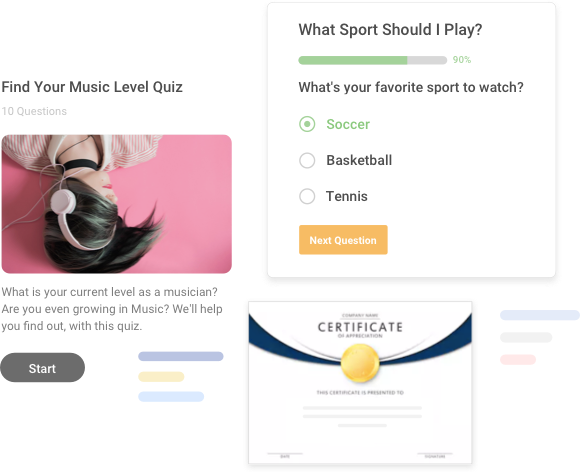 Add your own questions to build assessments from scratch or simply use ProProfs questions library containing over 100k+ customizable assessments and 1,000,000+ ready-to-use questions. It’s easy to use 15+ question types like multiple choice, fill in the blanks, true or false or more, to create best assessments. Simply use any one of our 100+ expertly designed themes to customize assessments and certificates. Brand your assessments by adding your own company logo, design, fonts, color schemes and typography features. Add your own signature, name and company logo or use our free templates to customize the assessment certificates. It’s easy to build public or private online assessments that greatly work on any device such as laptops, tablets and mobiles. Share online assessments via email, or embed on your website. 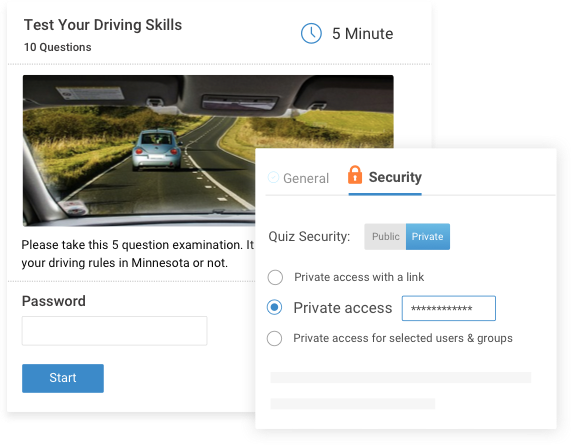 Students can have their own login credentials so that they can access privately shared assessments, from anywhere they prefer. It’s easy to create assessments in 70+ languages using ProProfs online assessment software. Easily secure your assessments using 100+ settings, smart configurations and offering unique login credentials to preferred groups or users only. Set timers or limit assessment availability to certain time frames and dates. Prevent cheating by shuffling questions, answers and multiple options for every assessment taken. You can set a timer to limit the time taken per question so that students have little to no chance of searching for answers from any external source. Creating online assessments for students; tracking and analyzing their performance has never been so easy. Use questions that are automatically graded to save time and effort. It’s simple to add score to questions so that students or learners can instantly see their results at the end of the assessment. Monitor who is taking your assessment, their scores and send reminders to those who haven’t. Analyze their performance with the help of auto-grading feature and generate instant yet personalized feedback. Online Quiz Maker for Businesses help companies to screen potential candidates for a job and assess the skills of existing employees. Trainers can ensure all employees are up-to-date on industry working standards with tests such as an OSHA compliance test, sexual harassment test and many more. Likewise, HRs can create pre-employment assessments to test the skills of potential candidates on a range of subjects such as MS Office suite, IT, language, healthcare and more. Online Quiz Maker for teachers can help in creating assessments and easily test their students on any topic by using online assessments. They can create timed online assessments or support their daily classes with online practice tests, which students can take during class hours or even from their homes. The online tests are automatically graded and completely paperless saving teachers hours of time and effort. How to create an employee skill assessment test? Keep your test focussed and create a unique test for every position in your company. Good soft skills or communication skills are an essential requirement for many positions. Keep a soft skills section in every test. At times, certain questions can be interpreted as discriminatory. Review your test to ensure that all the legal requirements are in association with hiring processes. Finding it difficult to create the test? Try an online assessment software and create employee skill assessment in minutes.